CAUTION: Escaping fluid under pressure can penetrate the skin causing serious injury. Relieve pressure before disconnecting fuel or other lines. Tighten all connections before applying pressure. Keep hands and body away from pinholes and nozzles which eject fluids under high pressure. Use a piece of cardboard or paper to search for leaks. Do not use your hand. If ANY fluid is injected into the skin, it must be surgically removed within a few hours by a doctor familiar with this type injury or gangrene may result. Doctors unfamiliar with this type of injury may call the Deere & Company Medical Department in Moline, Illinois, or other knowledgeable medical source. Loosen the air bleed screw (A) two full turns by handon fuel filter base. 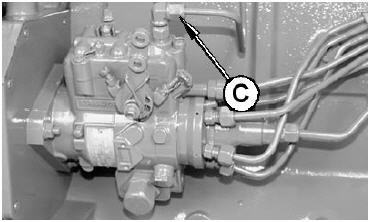 Operate supply pump primer lever (B) until fuel flow is free from air bubbles. Tighten bleed plug securely, continue operating hand primer until pumping action is not felt. Push hand primer inward (toward engine) as far as it will go. Start engine and check for leaks. If engine will not start, it may be necessary to bleed air from fuel system at fuel injection pump or injection nozzles as explained next. 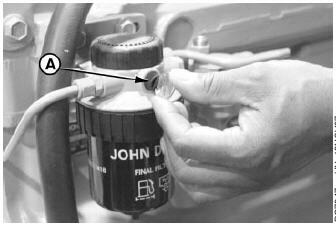 Slightly loosen fuel return line connector (C) at fuel injection pump. 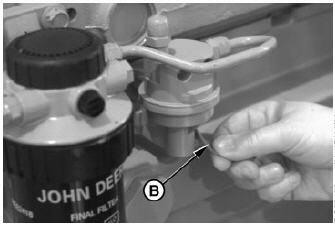 Operate fuel supply pump primer lever until fuel, without air bubbles, flows from fuel return line connection. Tighten return line connector to 16 N•m (12 lb-ft). d. Leave hand primer in the inward position toward cylinder block. 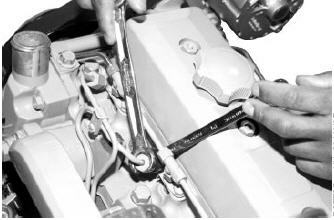 Using two open-end wrenches, loosen fuel line connection at injection nozzle. Crank engine over with starting motor (but do not start engine), until fuel free from bubbles flows out of loosened connection. Retighten connection to 27 N•m (20 lb-ft). Repeat procedure for remaining injection nozzles (if necessary) until all air has been removed from fuel system. If engine still will not start, see your authorized servicing dealer or engine distributor.